Lauren Boggs Meslar has been selling patterned paper straws, hemp gift cords and other lifestyle goods on Etsy since 2012, relying on sales from the Etsy shop and her own e-commerce website to "help pay the bills" for her family. 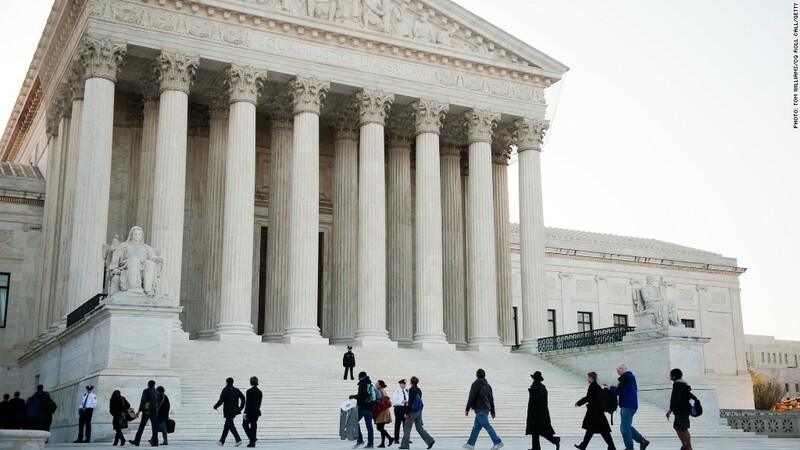 But a new Supreme Court ruling upends how states handle online sales taxes. Now Meslar worries about the future of managing her own small internet business. "I'm in 'wait and see' mode to see what the actual impact will be for a microbusiness such as mine," Meslar told CNNMoney. "I am not concerned about profit, just the potential headache," she added, noting that she might have to comply with tax rates "for, what, 9,000 districts?" The Supreme Court ruled Thursday that states can compel retailers to collect sales taxes even if they don't have a physical presence in the state, effectively paving the way for more taxes on online shopping. The ruling was praised by some in the retail industry for clarifying how sales taxes should be handled in the ecommerce era. But for independent vendors who rely on Etsy (ETSY), eBay (EBAY) and other online shopping platforms, the decision leaves more questions than it answers. "I've been seeing a lot of Chicken Little 'the sky is falling, the sky is falling,'" says Sueanne Shirzay, who operates a shop on Etsy and her personal website selling handmade jewelry. Other sellers she's spoken with "are afraid they are going to have to do 50 sales tax returns." In theory, Thursday's decision should primarily impact bigger businesses rather than artisanal sellers. The ruling specifically came in response to a South Dakota law that applied only businesses with more than $100,000 in sales, or at least 200 transactions, in the state each year. However, legal experts say it remains unclear whether some states may impose taxes on retailers even smaller than those affected by South Dakota's law. "The decision does not articulate much of a floor for what states may do, so it is possible that another state could pass a law with lower thresholds than the South Dakota law," says Hayes Holderness, a law professor at the University of Richmond. Holderness says platforms like Etsy could potentially assume the costs associated with complying with the new tax framework "to attract merchants." But, he adds, "the risk of audit will remain on the vendors in most states." Etsy declined to comment for this story. In a blog post Thursday, Etsy CEO Josh Silverman called on Congress to craft a "simple, fair federal solution" for the many smaller vendors those operating on operating on its platform. "More than three quarters of Etsy sellers are businesses of one," Silverman wrote. "They have very different needs and challenges than larger online retailers and we are encouraging them to sign a petition that tells policy makers to support microbusinesses like theirs." EBay also said in a statement Thursday that Congress needs to "provide clear tax rules, with a strong small business exemption." The company said that any attempt by states to "subject remote small businesses to audits and lawsuits" will lead to "increased litigation across the country." To protect against audits and running afoul of new tax standards, Etsy sellers like Jessica von Braun are rushing to understand this week's ruling and expects to hire a tax attorney and an accountant this year. "So many of us who sell on platforms like Etsy are juggling all the time, families and businesses, or potential businesses along with day jobs," says von Braun, whose Etsy shop sells original artwork. "So I do feel like I'm playing catch up." Not everyone on Etsy is worried about the Supreme Court ruling, though. Shirzay believes the verdict will "level the playing field a little bit more" between online and offline retailers. In her case, that hits close to home. While she runs an online shop, her husband works with bricks-and-mortar.